Investing in our replacement patio doors is an excellent idea. 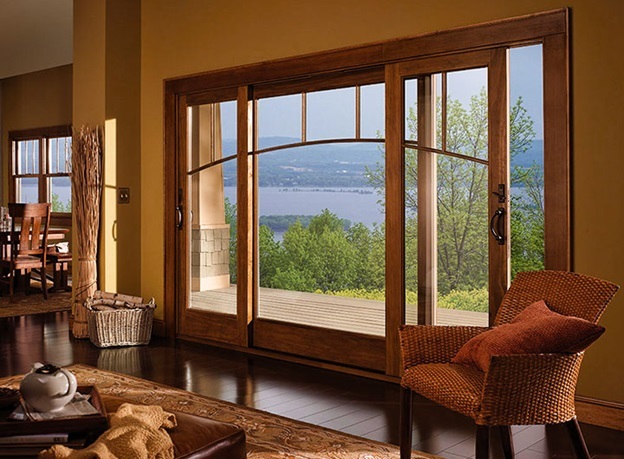 Our patio doors are energy-efficient, durable, long-lasting, and beautiful. Renewal by Andersen® of Las Vegas offers two different kinds of patio doors for your home: hinged patio doors and sliding patio doors. We can provide sliding French doors that redefine the traditional French patio door category. Our Frenchwood® gliding patio door has the space-saving features of sliding doors and the classic appeal of French doors. We provide a variety of traditional grille patterns to match your home’s style. Our door also comes with pine, maple, oak, or white interior. Finally, the door features a rigid vinyl sheath for a beautiful appearance that needs minimal maintenance. We recommend our contemporary sliding doors for your door installation if you have a more modern home. Our Narroline® gliding patio doors have a stainable natural pine interior and sleek door profiles. Renewal by Andersen designed our contemporary doors to allow for maximum glass area. This leads to better views and better transitions. All of our doors also come with our High-Performance™ Low-E4® glass. This glass reflects heat, allowing you to enjoy sunlight and great views without any worry. As an innovator among door contractors, we also offer our Perma-Shield® gliding patio doors. These doors have rigid vinyl sheath that protects its exterior. It’s perfect for homeowners that want a beautiful and easy-to-own door. Additionally, all of our sliding patio doors feature reliable and smooth operation. Our dual ball-bearing rollers with self-contained leveling adjusters make our patio doors “glide” and not just slide. Combine this with its low maintenance exterior, and our Perma-Shield® Gliding Patio Doors are convenient. Our gliding patio doors are an excellent idea for homeowners who want a convenient, reliable, and easy-to-maintain patio door. Our Frenchwood patio door even provides traditional homes the benefits of sliding doors without compromising on style. If you’d like to learn more, we will be glad to help. We serve North Las Vegas, Green Valley, Henderson, Summerlin, and Boulder City. Call us at (702) 722-2052 to learn more about our gliding doors. You can also schedule a free in-home consultation.